Resurrecting the Sublime is an immersive exhibition which invites us to smell two extinct flowers, both lost due to colonial activity. Commissioned by WGSN’s Lisa White, this large-scale installation at Saint-Étienne International Design Biennale is part of an ongoing collaboration between artist Dr. Alexandra Daisy Ginsberg, smell researcher and artist Sissel Tolaas, and an interdisciplinary team of researchers and engineers from the biotechnology company Ginkgo Bioworks led by Dr. Christina Agapakis, with the support of IFF Inc. The installation allows us a glimpse of two flowers: one vitrine is filled with the smell of the Hibiscadelphus wilderianus Rock (Maui hau kuahiwi in Hawaiian), once indigenous to ancient lava fields on the southern slopes of Mount Haleakalā, Maui, Hawaii, before its forest habitat was decimated by colonial cattle ranching; the final tree was found dying in 1912. The other contains the Orbexilum stipulatum, or Falls-of-the-Ohio Scurfpea, last seen in 1881 on Rock Island in the Ohio River, Kentucky, before U.S. Dam No. 41 erased the island in the 1920s. Using DNA extracted from flower specimens from Harvard University's Herbaria, the Ginkgo team used synthetic biology to predict and then resynthesize gene sequences that encode for fragrance-producing enzymes. Using Ginkgo's findings, Tolaas reconstructed the flowers' smells, using identical or comparative smell molecules. We know which smell molecules the flowers may have produced, but the amounts are also lost. In Dr Ginsberg's installation design, fragments of each flower's smell mix: there is no "exact" smell. 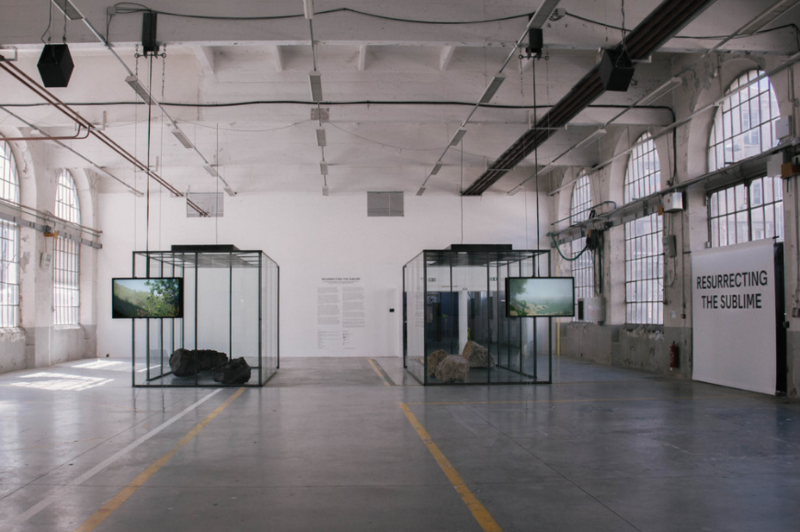 The lost landscape is reduced to its geology and the flower's smell: the human connects the two and becomes the specimen on view. Resurrecting the smell of extinct flowers so that humans may again experience something we destroyed is awesome and perhaps terrifying; it evokes the "sublime". But this is not de-extinction. Instead, biotechnology, smell, and digitally reconstructed landscapes reveal the complex interplay of species and places that no longer exist. Resurrecting the Sublime asks us to contemplate our actions, and potentially change them for the future. Marije Vogelzang 2019: all about touch….